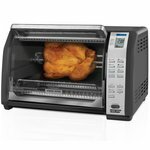 Overall this is a great toaster oven. I use it more as an oven than as a toaster. It is great to have an extra "oven" especially if you have something small that you need to cook. It heats up quickly and cooks things quickly. This can be a problem though when you use the toaster part. At first it seems like it is taking forever to toast, then all of a sudden you have burnt toast, bagel, etc.. So you do need to monitor your food closely. The problem is with the toaster function, it is very vague as to how much you have it set to "toast". There are just some lines on the knob, very hard to be accurate. 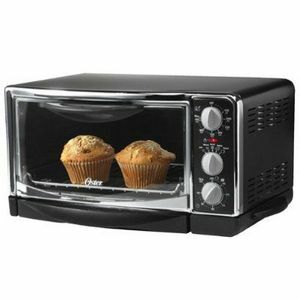 But, overall if you want a toaster oven to use to cook in more than toast then this is a good fit. The crumb tray is easy to clean, and easy to wash. Crumbs can get caught in the door though. Our family of six needed something bigger than a regular toaster to help reduce the morning waiting line in the kitchen, so we bought this toaster oven from Kohl's. The Oster 6-Slice Toaster Oven does not have a convection feature, but that was fine with me. I thought I would only be using it for toast... I actually use it for a lot more than that. It's perfect when I have a small amount of food to cook and I don't want to heat up the whole kitchen by turning on the regular-sized oven. My kids love to make their own mini pizzas by themselves in this toaster oven. Using the function selector knob, you can set this appliance to toast, bake, broil, and keep food warm. There is a fully adjustable thermostat and a timer for up to 60 minutes with a little bell. The wire racks are removable and configurable and there is a removable crumb-tray for easy clean-up. The window is very large so it's easy to keep an eye on your food. My only complaint is that it takes up a large amount of counter space, but there's not much that can be done about that. I've owned this for a few years now and am happy to say that it's still going strong. 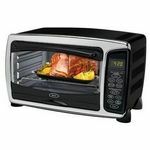 Oster Toaster Oven great for saving money on operation costs. 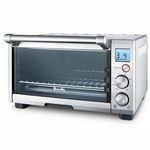 This toaster oven has been wonderful at toasting nuts, bread, and baking small pizzas. I think you could even get away with baking brownies or cookies in this oven, although I have never tried it. I would recommend it to anyone who has low space and do not have an oven. The cord is very inconveniently short though. 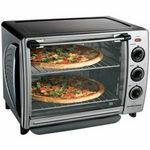 Toaster ovens are also wonderful for anyone who does not feel like heating up a whole oven for one slice of pizza or for multiples. I like using mine in the summer especially because it doesn't heat up the whole house like a regular oven. It also saves money by using the toaster oven instead of the regular oven because it doesn't take as much energy to heat up the toaster oven. This model is great for kids because the outside case stays cool and prevents burnt fingers. Although the metal on the front does heat up, so you still have to watch for this. I'd be lost without my Oster Toaster Oven. I love my Oster Toaster Oven because there are so many good things about it. These are just the simple reasons: 1- See-through glass door with a cool touch handle. 2- lower rack for baking and upper rack for broiling. 3- bottom slide-out pan for crumbs or spill overs makes for easy cleaning. 4- fits on countertop or small spaces. 5- on/off light. 6- side handles for carrying. 7- rubberized feet makes it grounded. 8- attractive white metal case with silver mirror-like trim. 9- fits a meatloaf pan perfectly inside. 10- only weighs 15 pounds. It's outside dimensions are: 17"wide x11 1/2"deep x 9 1/4"high. Inside: 12"wide x 9 1/2"deep. 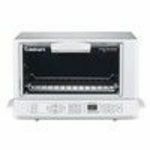 There are 3 setting knobs - Temperature in both fahrenheit and celsius from 150' to 450' ; Cooking - warm broil bake and toast; Timer - light and dark toast - then in 10 minute incruments up to 60 minutes and has a stay-on setting for keeping food warm. All knobs have OFF position. To cook something first set temp. - then cooking setting - then timer. Oven doesn't start until timer is set (safety) and you hear the timer during the cooking process. It makes a 'ding' sound when done and oven shuts off.